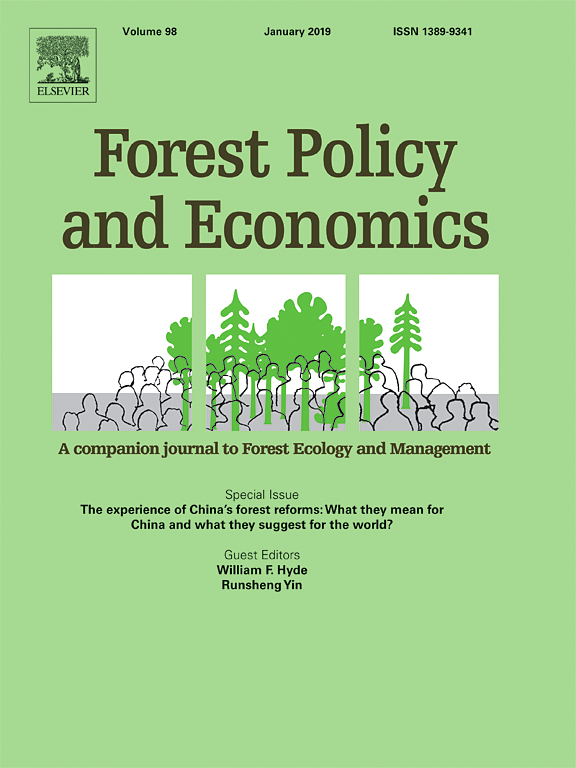 Forest Policy and Economics has grown into a well-established and recognized academic journal, which publishes peer-reviewed political and economic research relating to forests and forest-related industries, which are of a high scientific standard. It also welcomes contributions from other social science and humanities perspectives, which make a clear theoretical/conceptual and methodological contribution to existing international literatures. These may include, but are not limited to, planning, sociology, anthropology, history, jurisprudence, and psychology research on forests. Authors: Malkamäki, A.; Toppinen, A.; Kanninen, M.
Indonesia's Forest Management Units: Effective intermediaries in REDD + implementation? Authors: Kim, Y.S. ; Bae, J.S. ; Fisher, L.A.; Latifah, S.; Afifi, M.; Lee, S.M. ; Kim, I.-A. Authors: Szulecka, J.; Obidzinski, K.; Dermawan, A. Authors: Maryudi, A.; Nawir, A.A.; Permadi, D.B. ; Purwanto, R.H.; Pratiwi, D.; Syofi'i, A.; Sumardamto, P.